The Star – an amazing casino in heart of Darling Harbour. It’s Saturday night and the Travel Czar makes his way through the complex with a bit of James Bond swager (if you’ve seen Casino Royale – you know what I’m talking about). I quite like the whole casino thing: glam girls, vices, liquor and casino chips… it’s a bit like Vegas without the tackiness. So the Travel Czar looks for a spot with a view to have a light dinner. 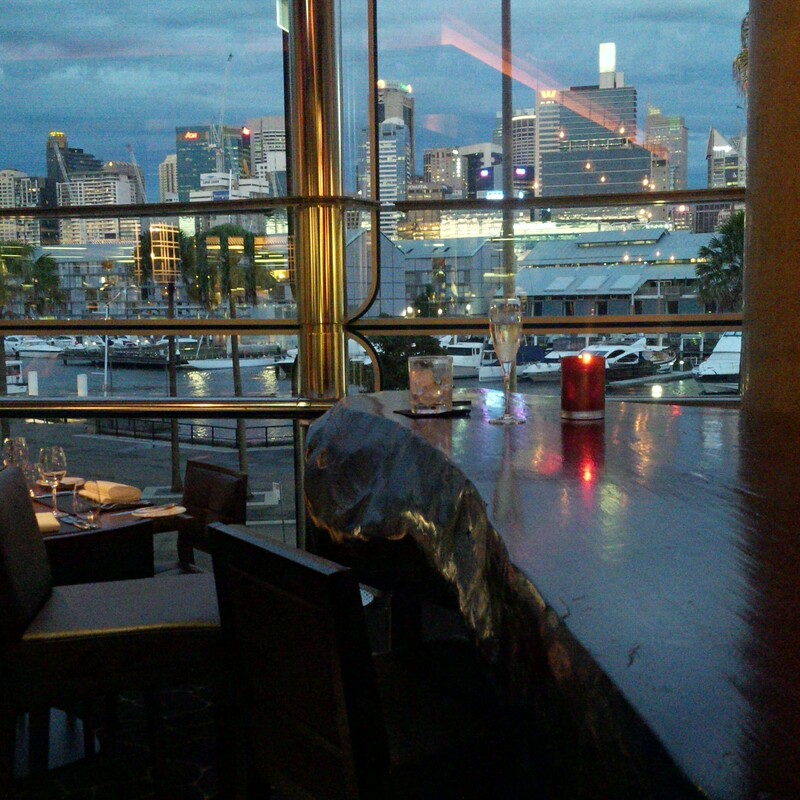 Black by Ezard’s seems like the perfect spot, it’s quiet, it has a “look at moi” feel, apparently has good food, a wine list to kill for (if you’re James Bond that is) and a view of Pyrmont Bay. The bar area is apparently booked for a function, so Travel Czar is ushered to a large, beautiful wooden table with a lovely view. Service is king in any bar, restaurant or airline. Travel Czar picked this place cause it was meant to impress – but it was doing anything but that. The host at the front informs me I can’t order items from the main restaurant menu, despite providing the menu to me and letting another family (seated at the same table later on) order from that very menu – nice way to wave goodbye to a several hundred dollars of business – but anyway… Then a dish which I didn’t order is brought to the table (a Bruschetta) and the wine order goes missing into thin air. The Bruschetta is provided complimentary (which is a very nice gesture from one of the waiters), that same waiter (who was a lovely French accent I think) is quick to follow-up on the wine and brings the rest of the food out with swiss style timing and precision. On the basis of those actions to remedy the situation I would actually recommend this place – the staff here were quite proactive in fixing what could have been a disaster. Note to all restaurants if you make mistakes fix them quickly and all shall be forgiven. So now to the food & wine – in short…it’s amazing. The Sliders just knock it out of the park! 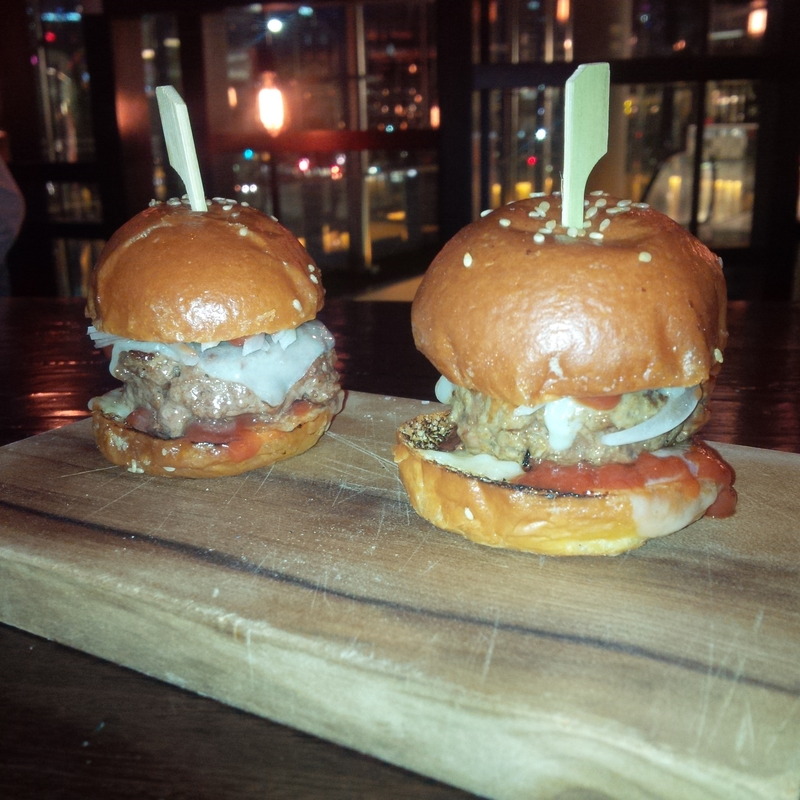 Now these would have to be some of the best sliders around (for other slider experiences please see DBW or The Botanist). The wagyu beef patties, sweet pickle, Gruyere, and tomato on a brioche bun. The patties are juicy and overflowing with flavour, while the smokiness of the toasted brioche just shines through to complement each ingredients in the slider. The pickles and tomato provide a real tangy flavour to the burger (which is not overpowering) and Gruyere adds that extra level of richness to the burger. It’s truly an amazing dish. 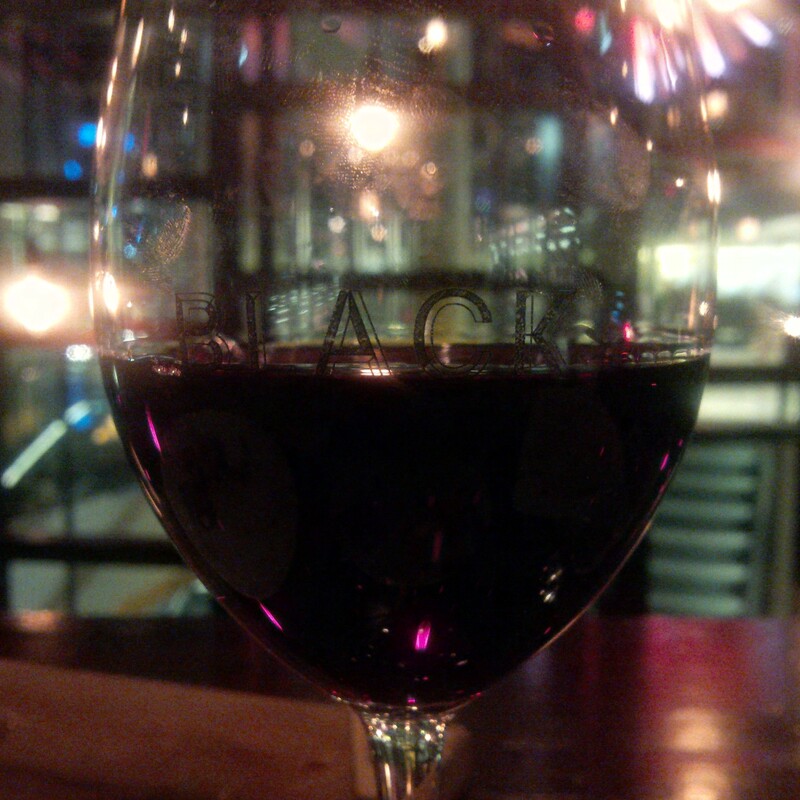 The wine is beautiful! The Howling Wolves Cabernet Sauvignon (2012) just goes to show you “back to the basics” is the sometimes the best when it comes to wine selection. It has an amazing taste of blackberries, plums and a hint of chocolatey tones. It’s so lovey and it pairs oh so well with the richness of the meat dishes which are ordered. The Bruschetta – has fresh juicy tomatoes flavours with the vinegary tang of the tomato kiss pepper. The mozzarella adds a soft creamy flavour and silk texture, to the dish. 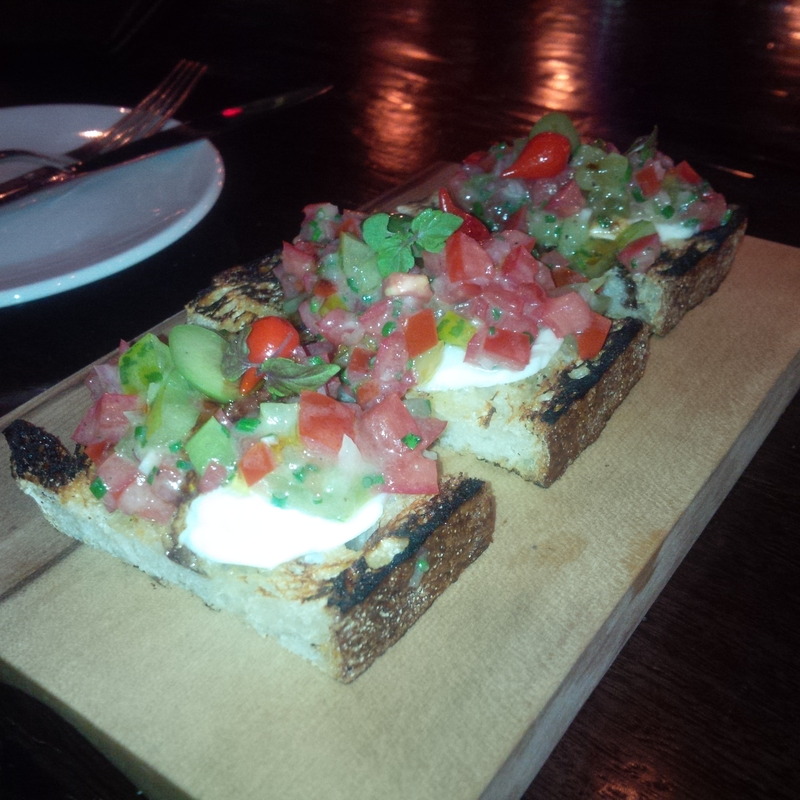 But what really does it again is the smokiness of the toasted bread which just adds that little kick to the bruschetta. The Carpaccio is next. 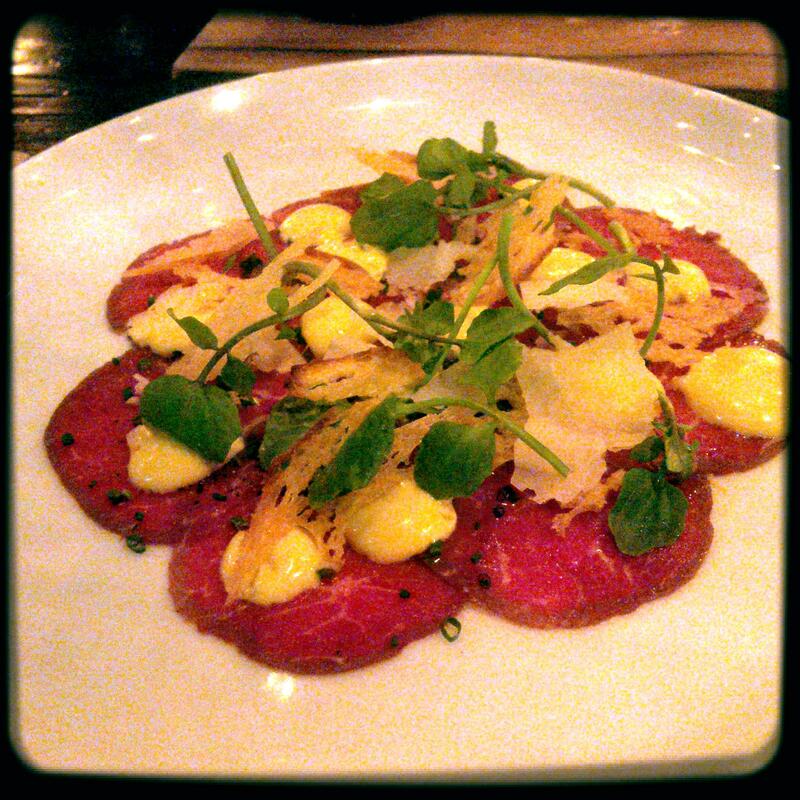 It is amazing (It was actually invented at Harry’s Bar in Venice – see my review of the place) – the soft oily raw wagyu beef slices are full of flavour, while the puffed wild rice which adds some lovely crunchy texture to the dish and pairs beautifully with the tenderness of the meat. The parmesan cheese adds some salt and creamy texture and tart hint to the dish. 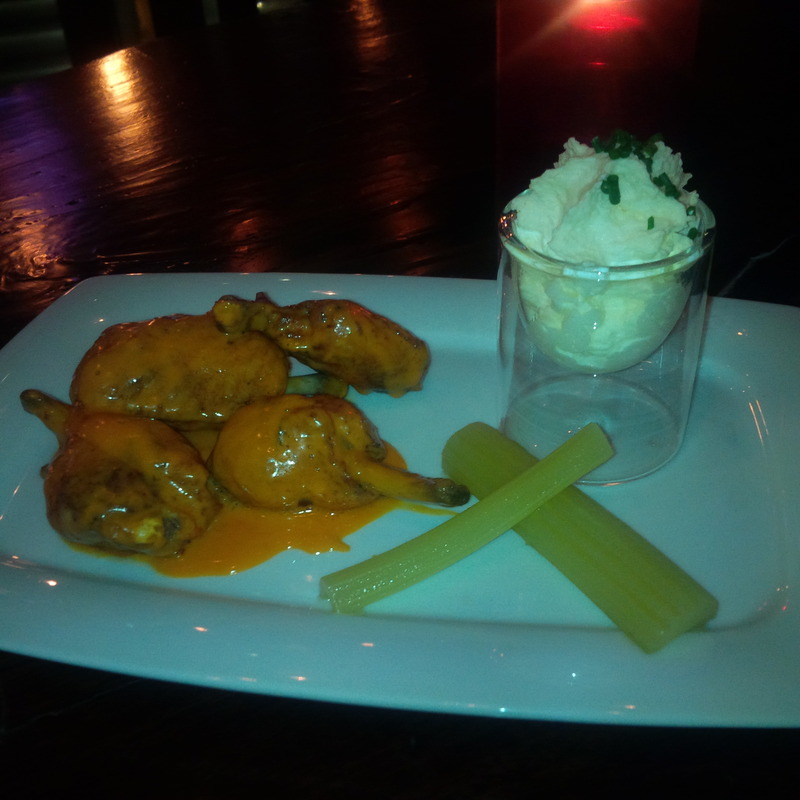 The Chicken Wings with Cayenne Pepper and Blue Cheese are lovely. 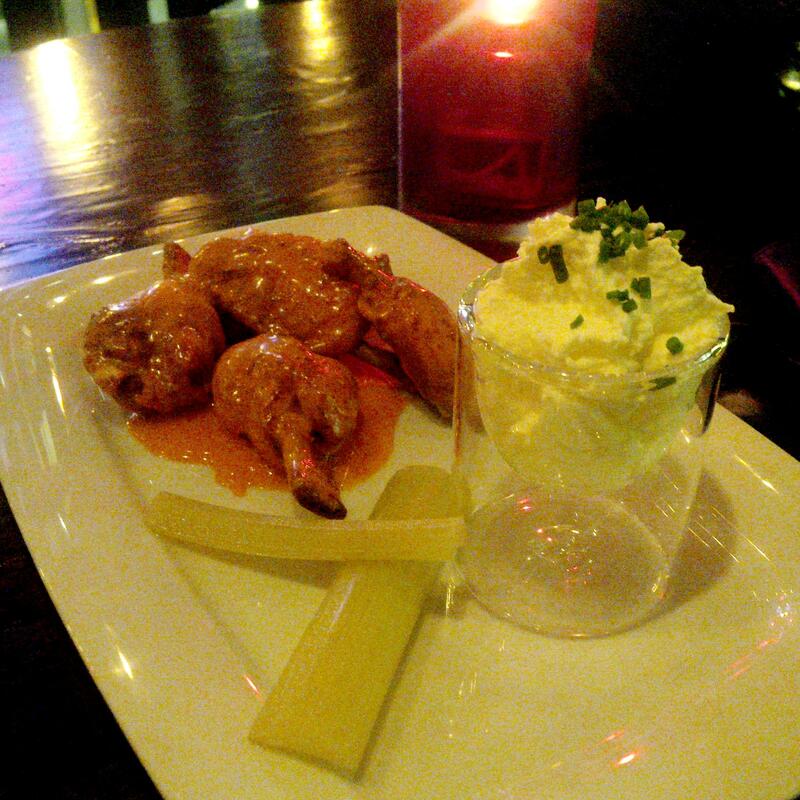 Again they are cooked to perfection with the soft tender chicken meat which slices well off the bone and the tang and spice from the Cayenne sauce which provides a right flavour for the meat (and actually doesn’t overpower it too much – which is critical). So after an interesting start, I must say this bar (and probably indeed the restaurant, assuming the quality carries over) is amazing. I find the bars attached to decent restaurants (like Rockpool, Catalina, Sepia and so on) offer variety, small plates and some very interesting tastes. 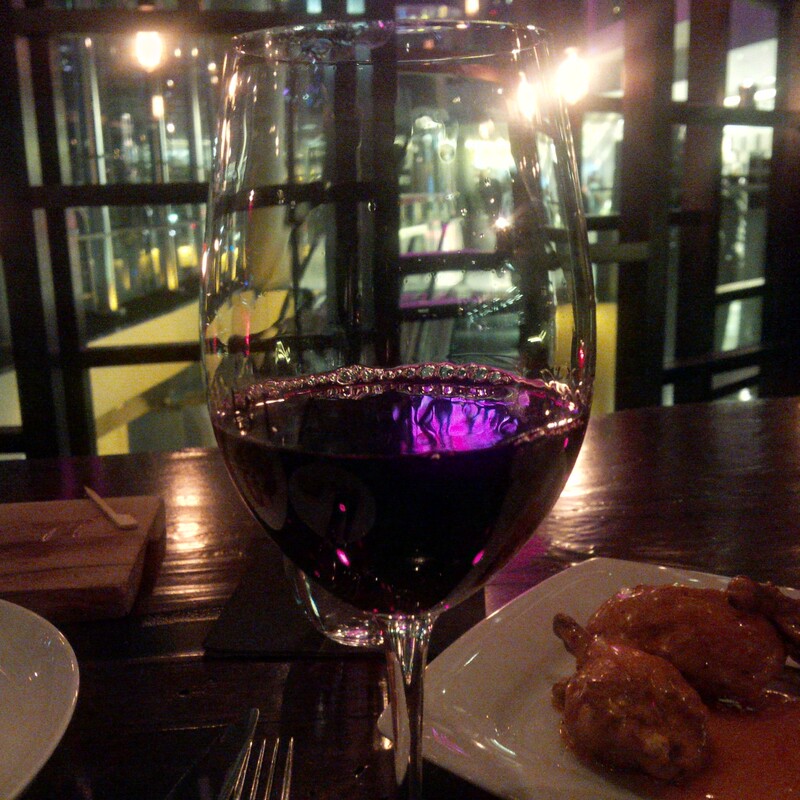 If you heading to the casino, I certainly recommend stopping by Black by Ezard – beautiful dishes, people and fun!